The concept of a separate Institution was established in 1959 as BHUTAN ROAD PROJECT, mandated to conduct the reconnaissance survey of Phuentsholing-Thimphu Highway. 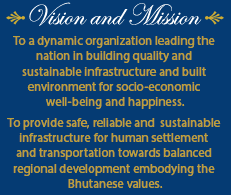 In 1961 (1-10-1961) the Bhutan Road Project was renamed as BHUTAN ENGINEERING SERVICES under the Ministry of Development, mandated to design and construct any infrastructure for every department of the Royal Government. The Bhutan Engineering Services was once again renamed as PUBLIC WORKS DEPARTEMENT IN (PWD) in 1971. In 1974 a committee was appointed to guide urban development and it was called Central Town Planning Committee (CTPC) consisting of all ministers and senior civil servants as members. In 1984 the CTPC was converted into National Urban Development Corporation (NUDC) and in 1989 the NUDC was renamed as the Department of Works and Hous¬ing by merging the non-road functions of the PWD. In 1993 the Departments of Roads and Works & Housing were merged and renamed as the Public Works Division (PWD). The new PWD was then transferred to the Ministry of Communications. In 1999 the roads and other functions were segregated and the Department of Urban Development and Housing (DUDH) was formed. The mandate of DUDH was to focus on urban development as the number of urban centers were rapidly increasing and urban problems like housing, infrastructure provision and municipal management issues were emerging, which needed to be addressed comprehensively and efficiently. Housing was separated from the department in 2003 and the DUDH was renamed as Department of Urban Development and Engineering Services (DUDES) during the First Annual Engineering Conference in 2004. Apart from the responsi¬bilities associated to the urban sector and providing engineering services to all other agencies, DUDES was also made the parent department for Dzongkhag engineering personnel. The rapid socio-economic development in the country placed immense demand on and for provision of infrastructure and development plans. In particular, the Department of Urban Development and Engineering Services, responsible for urban settlements and engineering services in the country, was faced with increasing challenges. In addition to the com¬plexity of urbanization, rapid changes were also taking place in villages and other settlements. On the other hand, there was increasing need for engineering services in the country and the technical support for local governments especially in view of the development focus of the 11th Five Year Plan. Therefore, to enable efficient delivery of services and to facilitate timely development, the Lhengye Zhungtshog approved the bifurcation of DUDES into the Department of Engineering Services (DES) and the Department of Human Settlement (DHS). This bifurcation would enable the two departments to specialize and focus more clearly on their respective areas of responsibilities. The Department reviews construction plans, issues permits, and performs inspections to ensure engineering projects are built safely and in compliance with approved codes in force and regulations helping to create a vibrant, livable, and safe-built community. The DES develops expertise in a specified area and meets the specific requirements of other functional ministries, departments, agencies who are not required to fritter away their resources, in areas or performing functions which were not their core area of operation. It is like outsourcing a specific activity but within the fold of the Government.